1. The Luminaries by Eleanor Catton - 6/5 stars. Enough said. 2. The Bone Clocks by David Mitchell - Not his best, but I love it nonetheless. 3. House of Leaves by Mark Z. Danielewski - What a good mindfuck. 4. To The Lighthouse by Virginia Woolf - What is the meaning of life? 5. The Sleeper and The Spindle by Neil Gaiman - Found the retelling to rival my favorite Snow, Glass, Apples also by Neil Gaiman. 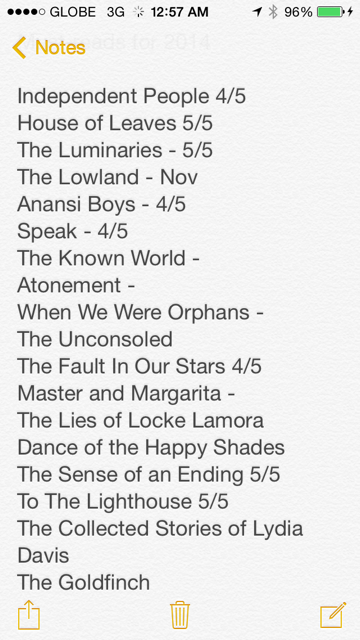 finishing each book, I would update the list with my personal rating. True, I managed to read some of the titles, but I’m still a bit miffed at myself because, well, isn’t that the whole point of them being “must-reads”? That I be able to read them within the time allotted? So, this year, I’m making a similar list of “must-read” books and carrying over those that I failed to read last year. As a goal, I’ll prioritize reading these books over others – excluding the book club’s monthly books, of course, and new titles from auto-buy/favorite authors (i.e., The Buried Giant by Kazuo Ishiguro and Trigger Warnings by Neil Gaiman, to name a couple). Before the end of 2014, I promised myself I'd catch up with my write-up backlog, which, as of this writing, added up to 8 novels, 2 short stories/retellings, and 7 graphic novels. For reasons I can no longer recall, I was unable to write down my thoughts about a particular book immediately after (or, at the very least, just a few days after) reading it, causing the pile-up. Unfortunately, too many things happened all at once and there just wasn't a lot of time left for writing stuff over the holidays. And so the backlog is now carried over to the new year. Pretty, right? I love all the blues and silvers. Thank you, Janus! Now I'm looking forward to writing the first feature for the year. Speaking of which, do you wish to be featured in the Project? Please do drop me a line at monique1125[at]gmail[dot]com! During the previous years, I enjoyed picking books to be read for a particular month, which began when I participated in my friend's Required Reading meme in her book blog. Even when she temporarily took a break from book blogging, I continued making my reading lists for specific months. This year, I'll carry on doing the reading lists at the beginning of the month because I find it fun, especially the photo-ops part. :D For my January reading list, stay tuned for a separate post for that. Yeee! I have almost everything in your 2015 reading list, too. And since I had a great time buddy reading with you last year...Do you mind buddy reading 'When We Were Orphans' by Kazuo Ishiguro with me? I understand we have Perdido Street Station pa with Melissa and Aaron (who else?) early this year, right? I am wishing you luck in your goals, Monique! And I am cheering you for Atonement. The Luminaries 6 stars out of 5! Na curious ako! The Sleeper and the Spindle rivals Snow, Glass, Apples! Na curious ako! Haha. At meron siyang bago? Trigger Warnings? Will note that one down. So many things to say! First, please read Atonement and The Known World this year! Atonement's popularity is directly proportional to its greatness, yes, but the less popular The (un)Known World is just as compelling. Second, there's a spunky sparkly banner! Love it! Yes. Ishiguro on April and Perdido on February. Thank you! I think my comment yesterday got lost somewhere haha. Anyway, yay to Atonement. And also, watch the movie if you haven't yet.